Cleveland-based Verb Ballets closed out Cleveland Public Theatre's 2014 DanceWorks series with a program of two new works that harkened back to the modern dance style of its predecessor company the Repertory Project. Audiences used to Verb's mix of classical modern dance works from Paul Taylor and Martha Graham, the masterworks of Heinz Poll, and works from contemporary choreographers like Chung-Fu Chang and Shapiro & Smith could have seen this program as being somewhat out of character for company. The program at CPT's Gordon Square Theatre May 2 opened with the premiere of Vietnamese choreographer Ngo Thanh Phuong's "How Ya Doin'?". 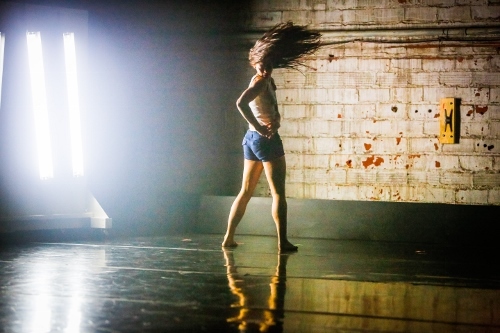 The dance-theater work created during a Cleveland Foundation Creative Fusion residency might best be described as experimental in that Phuong's choreography introduced a number disparate ideas and production elements into a collective pot. Unfortunately, not all of those ideas meshed and the work proved to be a bit of a hot mess. Phuong's choreography was a bit of an enigma in that in parts of the work – which began with Verb's dancers moving to recorded voices of mothers lamenting the absence of their grown children – showed a sophistication of movement style and phrase work, while others bore resemblance to bad student work with Verb's dancers improvising like recreational dancers told to wriggle about. Phuong's mishmash of ideas such as the often used gimmick of dancers using miniature flashlights to light each other's movements and the seeming use of the entire "disaffected youth" playbook, were all muddled together giving the work a grab bag feel to it rather than those elements being a part of the work's developmental arc. Phuong has talent, she just needs to make better use of that talent by focusing and refining her ideas while maintaining the quality level of choreographic movement she showed in flashes in "Ho Ya Doin'?". Next, Baldwin Wallace University dance faculty member Sara Whale's "Muse" fared better in its compatibility with Verb's dancers. Set to music by Baldwin Wallace University composition student Danny English, the group work for the full company was an homage to the works of Austrian symbolist painter Gustav Klimt. In it, Whale had Verb's dancers posing atop boxes referencing imagery contained in Klimt's well known paintings like The Kiss (1907–08). The dark atmosphere of Cleveland Public Theatre and Whale's mostly utilitarian choreography for those sections did little to capture the gold leaf vividness, texture and color contained in Klimt's paintings which left "Muse" feeling a bit dull. Whale's choreography however was well crafted and contained some nice lines, movement, and imagery such as Verb's male dancers yanking on the ponytails of the women in the piece. While the company performed it well, the work did little to challenge them technically and was at times predictable. Neither of these works were a great fit for Verb Ballets. The company of late seems to have lost its identity grasping at any straw that comes their way or perhaps they are attempting to craft a new identity. In either case, for audiences and critics (like myself), coming to their shows it has become a crapshoot as to which Verb Ballets we will see. Verb Ballets in Ngo Thanh Phoung's "How YA Doin'?". Verb Ballets in Sara Whale's "Muse".